Editor’s note: Because many marketers remain confused about what buyer personas are and how to build them, we’ve updated this post. Don’t get me wrong: I’m glad to see that marketers are starting to use buyer personas for content marketing. Buyer persona development is a positive trend that, when done correctly, helps content marketers become a strategic asset and deliver a real competitive advantage to their organizations. However, there’s a lot of confusion about what buyer personas are and aren’t and how to develop them. I worry that ‘buyer persona’ could become just another meaningless buzzword. That would be a shame, because personas are such a useful tool. In my eBook, The Buyer Persona Manifesto, I define a buyer persona as an archetype; a composite picture of the real people who buy, or might buy, products like the ones you market, based on what you’ve learned in direct interviews with real buyers. The key point here is actually talking to buyers. If your buyer personas are based on generic or internal ideas about your buyers, your content won’t be any better than it was before you had personas. Marketers typically gather facts about their buyers by talking to a sales rep, meeting with a product expert or conducting online research. It shouldn’t be surprising that these sources don’t have the information that marketers really need. Your sales reps will readily admit that buyers mislead or even lie to them about how they compare and choose one solution over another. Moreover, even your product experts are unlikely to be buyer experts because they interact mostly with current customers plus a select few of your largest prospects. And mining online data leads to buyer personas that are little more than job descriptions with high-level pain points. If content marketing is going to benefit from buyer persona development, you will need to uncover specific insights that are unknown to your competitors or anyone inside your company. This information will be so valuable that you would never post it on your website. However, it will tell you, with scary accuracy, exactly what you need to do to deliver content that persuades buyers to choose you. How to fix this: The only way to gather clear, unexpected insights about how your buyers make decisions is to have a conversation with them. Make it a goal to spend a few hours a month interviewing recent buyers, including those who chose you and those who did not. Ask buyers to walk you through their decision, starting with the moment they decided to solve this problem. Each in-depth conversation should take 20 or 30 minutes, but the time it will save you in planning, writing, and revising content for each buyer persona will be immeasurable. Marketers sometimes make the mistake of gathering buyer information that doesn’t really help them deliver more effective content or campaigns. If your marketing team is debating whether your buyer persona is a man or a woman, or if you are bogged down finding just the right stock image of your persona, then you’re focusing on the wrong things. Unless you’re a B2C marketer, the buyer’s gender, marital status and hobbies are rarely relevant. Priority initiatives: What are the three to five problems or objects that your buyer persona dedicates time, budget, and political capital to? Success factors: What are the tangible or intangible metrics or rewards that the buyer associates with success, such as “grow revenue by X” or a promotion? Perceived barriers: What factors could prompt the buyer to question whether your company and its solution can help with achieving his or her success factors? This is when you begin to uncover unseen factors, such as competing interests, politics, or prior experiences with your company or a similar company. Buying process: What process does this buyer persona follow in exploring and selecting a solution that can overcome the perceived barriers and achieve their success factors? Decision criteria: What aspects of each product will the buyer assess in evaluating the alternative solutions available? To be useful, the decision criteria should include insights both from buyers who chose a competitor and those who decide not to buy a solution at all. These “Five Rings of Insight”, when gathered directly from buyer interviews, will tell you how to reach undecided buyers with content that addresses their key decision-making process points. 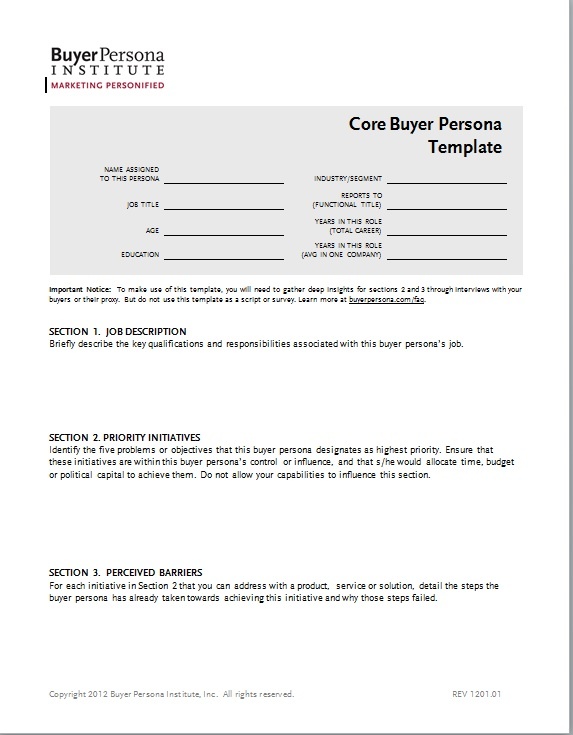 Using the Core Buyer Persona Template and Product-Persona Connection Template (click on the sample images below for a registration-free, full-sized download) will help you organize your findings from your calls so that everyone on your team has access to these critical insights. This mistake happens when marketers layer buyer personas onto their existing market segments, frequently defined by demographics such as industry or company size. Many people think they should create a new buyer persona for each of the relevant job titles in each of these segments. Not so. 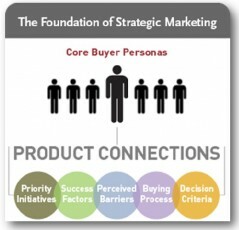 One company I worked with initially planned to build 24 different buyer personas. Ambitious? Yes. Necessary? No. When they started interviewing their buyers, they were able to pare that list down to 11. Because their marketers are continually conducting new buyer interviews and gaining new insights, we expect to be able to consolidate that list even further. How to fix this: When you have captured the Five Rings of Insight about your buyers, you will see that differences in job title, company size, and industry do not necessarily relate to differences in your insights. For content marketing and most other marketing decisions, you will only need a separate buyer persona when there is a significant difference on several of those findings. For example, you may find that buyers of your RFID technology in both the hospitality and consumer products industries have nearly identical priority initiatives (a mandate to be more competitive) and perceived barriers (need an incremental approach). If you have a strong story to communicate on each of these points, one buyer persona may be the best way to ensure effective messaging and content marketing. Using a telephone script or online survey to learn about your buyers won’t reveal anything you don’t already know — inevitably, your buyer’s first answer to any question will be something obvious, high level, and not particularly useful. The structure imposed by surveys and scripts leads to nice charts, but it fails to reveal the new insights that you need. How to fix this: It takes a bit of practice, but you can learn how to have the unscripted, agenda-driven conversations that will lead recent buyers to tell you, in incredible detail, exactly how they weighed their options and compared your solutions with your competitors’ offerings. The key to success in developing a buy persona is asking probing questions based on your buyer’s answers. For example, if buyers tell you they chose you because your solution is easy to use, you might ask follow-up questions to understand what about the solution needed to be easy. Or you might ask about the training the buyer expects to attend before it is considered to be “easy” in their mind. Another follow-up question might seek perspectives on the resources the buyer will consult, or steps they will take, to compare your solution’s ease of use to their other options. When you avoid these four mistakes, your buyers’ needs will be the focus of your marketing strategies and tactics. You’ll become so attuned to your buyers’ perspective that you will consistently impress them, confidently delivering content that answers their questions and persuades them to choose you. Want to learn more about buyer personas? Attend Adele Revella’s workshop, Building Your Buyer Personas, at Content Marketing World, September 4-6 in Columbus, Ohio. Adele Revella is the founder and president of The Buyer Persona Institute, a firm that helps marketers interview buyers for the insights that are the foundation of strategic marketing and sales enablement. She will deliver a pre-conference workshop “Building Your Buyer Personas” on Sept. 4, 2012, at Content Marketing World. 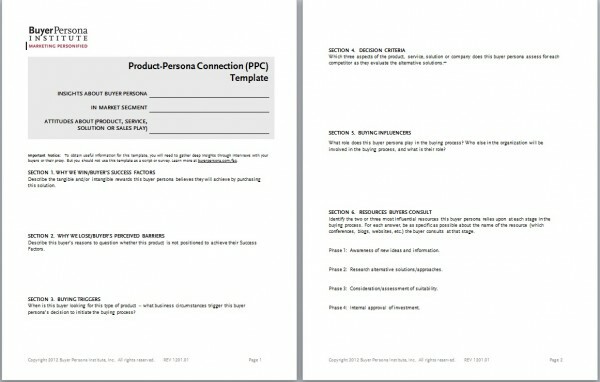 Download her free eBook The Buyer Persona Manifesto. Follow Adele on Twitter @buyerpersona or on the Institute’s Facebook page at https://www.facebook.com/buyerpersona.